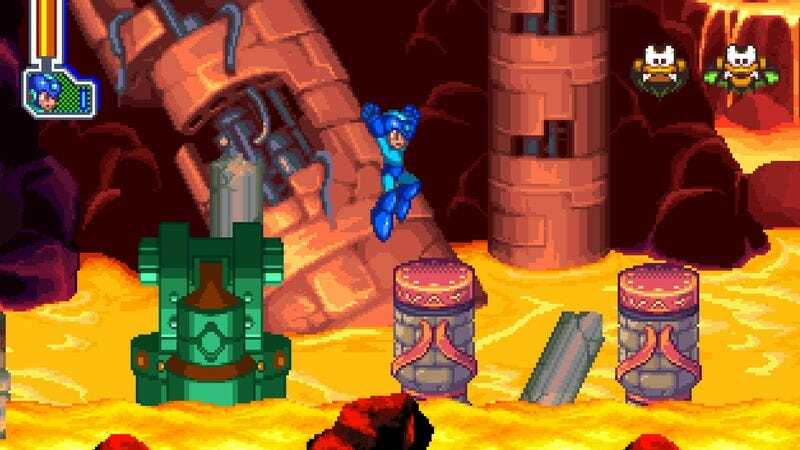 Mega Man is one of those fundamental video game series that I’m ashamed to say I’m still not very familiar with. Over the last few years, I’ve been doing my due diligence and really trying my best to get through the essentials, at least. I save-scummed my way through Mega Man 2 and 3. I tried my hand at X and Legends. But this weekend, I’m looking forward to spending some quality time with lesser-appreciated entries, thanks to Capcom’s nifty new anthology Mega Man Legacy Collection 2. The first Legacy Collection was a landmark, a lovingly assembled product that packaged up the blue bomber’s NES years with incredible attention to detail. The emulation was spectacular, the bonus features were enriching and clever, and the overall presentation was slick and reverent. Digital Eclipse, the preservation-focused studio behind the original and Capcom’s Disney Afternoon Collection, did not return for Legacy Collection 2, and while it’s still a fine anthology with well-emulated versions of Mega Man 7 through 10 (bringing them to current-generation consoles and PCs for the first time), it isn’t quite as polished or lively as Digital Eclipse’s projects. Also, the in-house team at Capcom responsible for it decided to get rid of save states in favor of a new check-pointing feature, which just seems incredibly backward for this sort of release in 2017. Some of us are terrible at games, Capcom. Actual Sunlight is the most shattering game I’ve ever played—a funnel into a suicidal person’s brain that never, even in its final moments, yields toward the possibility of redemption. There is one horrible release, and you move, horribly, toward it. There are a lot of so-called confessional games out there, but designer Will O’Neill’s game stands alone among them, his eloquence and pitch-black humor elucidating the experience of living, day by day, in a state of exquisite agony. That it’s all drawn in top-down RPG Maker sprites, like a perverse Link To The Past, seems to both mock the protagonist’s unbearable misery and cast it in a singular light. It’s a cry—not exactly for help but rather something more primal—drawn in a language that we more immediately register with nostalgia, even childlike joy. Actual Sunlight exists in a place where such optimism is a source of agony. The legacy of the game has quietly grown over the years since its 2014 release, and O’Neill’s new project, Little Red Lie, promises to do the same. Much of it is superficially similar—the SNES-style top-down mechanics intercut with stylized anime drawings, the relentless clarity of its prose, the surprisingly hot synth-wave soundtrack—but the scope is broader. Now alternating between two characters, it details the human cost of global capitalism from the perspective of someone drowning in debt and another person drowning in money. It flips Actual Sunlight’s internal struggle to something much more external, allowing its ruminations on aging, drug addiction, global warming, and more to feel like more than the moribund musings of someone at wit’s end. It’s just as shattering, but by going big, its darkest insights echo longer. If you’re interested in games as a medium for complicated expression, it’s essential.